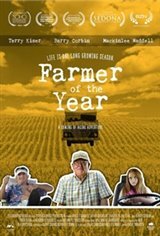 When Hap Anderson, a widowed 83-year-old Minnesota farmer who thinks he's still quite the ladies' man, sells his family farm, he finds himself adrift and staring a short future in the face. Driven by the possibility of showing up with an old flame and impressing his old army buddies, he sets out in a dilapidated Winnebago to attend his 65th WWII reunion in California with his directionless and unreasonably self-confident granddaughter, Ashley. Along the way they begin to understand and appreciate each other as individuals while discovering that being young and being old, aren't all that different.